S-4 Class Submarine (Government-type): Laid down, 9 November 1918, at Portsmouth Navy Yard, Portsmouth, N.H.; Launched, 21 April 1920; Commissioned, USS S-8 (SS-113), 1 October 1920; Decommissioned, 11 April 1931, at Philadelphia Navy Yard, Philadelphia, PA.; Laid up in the Reserve Fleet; Struck from the Naval Register, 25 January 1937; Final Disposition, sold for scrapping, 25 January 1937. 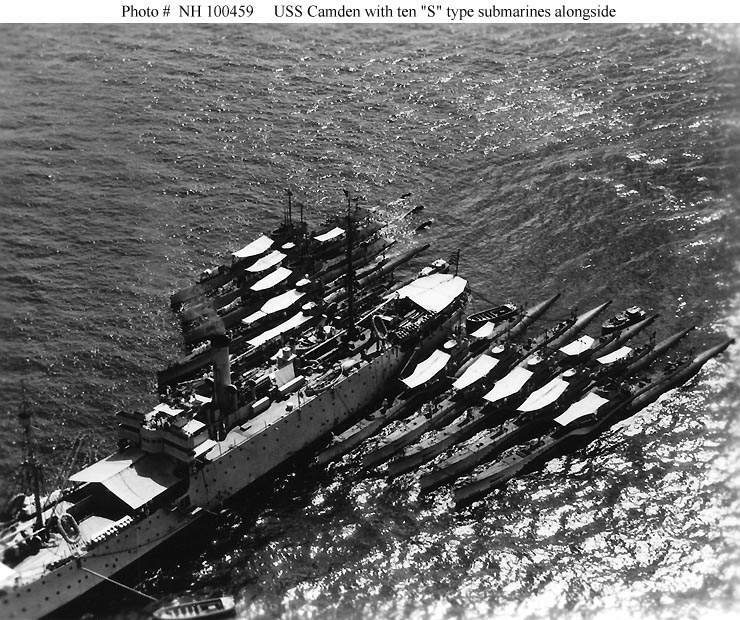 Specifications: Displacement, Surfaced: 876 t., Submerged: 1092 t.; Length 231' ; Beam 21' 10"; Draft 13' 1"; Speed, surfaced 15 kts, submerged 11 kts; Depth Limit 200'; Complement 4 Officers, 34 Enlisted; Armament, four 21" torpedo tubes, 12 torpedoes, one 4"/50 deck gun; Propulsion, diesel electric engines, New London Ship and Engine Co. diesel engines, 2,000 hp, Fuel Capacity, 36,950 gal. ; Westinghouse Electric Co., electric motors, 1,200 hp, Battery Cells, 120, twin propellers. 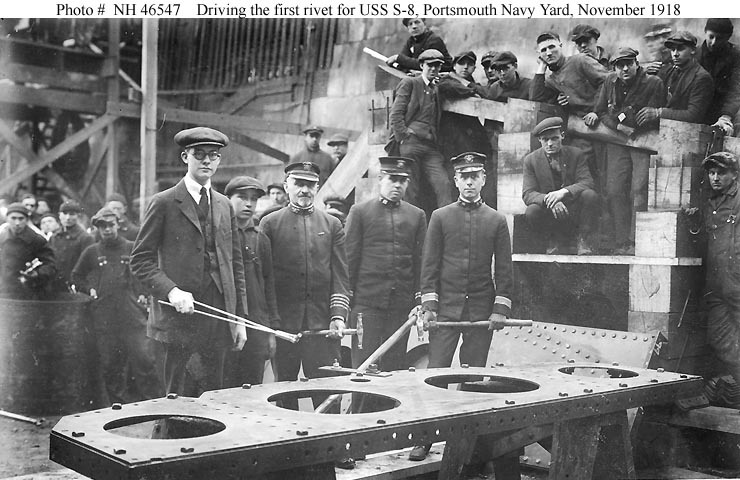 88k Driving the first rivet, during keel laying ceremonies for the S-8 (SS-113) at the Portsmouth Navy Yard, Kittery, Maine, 9 November 1918. Members of the ceremonial rivet driving team are identified as (from left to right): Joseph Lebinsky, Rivet Heater; Lawrence S. Adams, Rivet Passer; Captain F.W. Wieber, Riveter; Lieutenant H.F. McCarthy; and Commander F.W. Hyden. U.S. Naval Historical Center Photograph # NH 46547.
nephew of Captain F.W. Wieber, Riveter of the S-8. 112k Flags a plenty on S-8 (SS-113) as she is launched on 21 April 1920. Photo i.d. courtesy of Ric Hedman. 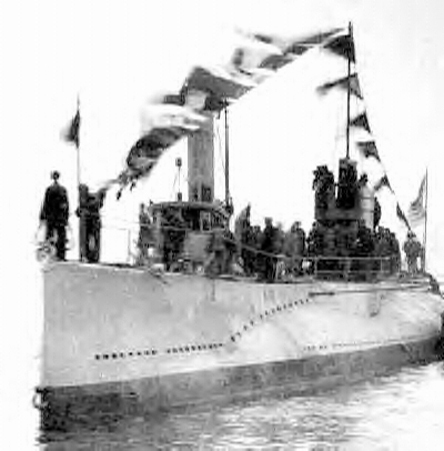 139k S-8 (SS-113), shown in April 1921, was a C & R-type boat (similar to S-4-9 & 14-17) built at Portsmouth Navy Yard. Of the three periscopes, #2 is an alti-periscope. Submarines sometimes flew the small metal flag atop it to warn surface craft of their presence in the hope of avoiding collision. Abaft the three periscopes is the telescoping mast. On deck are her Y-tubes (3 rats) and SC-tube. Unlike an E.B. design, this one shows all batteries concentrated forward under the crew's & officer's quarters, all of which were abaft the torpedo room. The vertical tube forward of the conning tower accommodates 4-in service ready rounds. Compared with the Holland version, these S-boats were much more heavily framed & more subdivided, with heavy bulkheads shown between the forward torpedo room, the accommodation space above the battery, the control room, the engine room & the motor room. Note the pipe aft, leading into the keel. In these boats something approaching an E.B. style duct keel was provided, with Kingstons under the control room & a main bilge pump (not shown) at the upper end of the curved pipe. 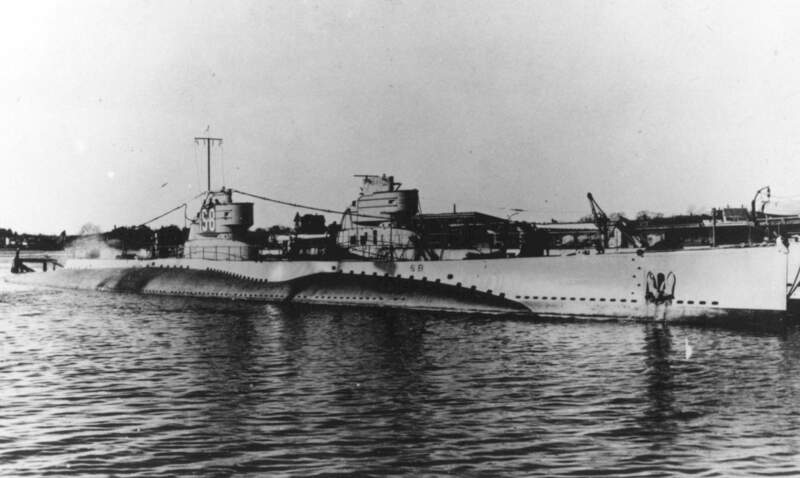 The combination of pressure-proof bulkheads & escape hatches forward & aft made it unnecessary to modify tyhem heavily after the S-4 (SS-109) disaster. Drawing by Jim Christley. Text courtesy of U.S. Submarines Through 1945, An Illustrated Design History by Norman Friedman. Naval Institute Press. 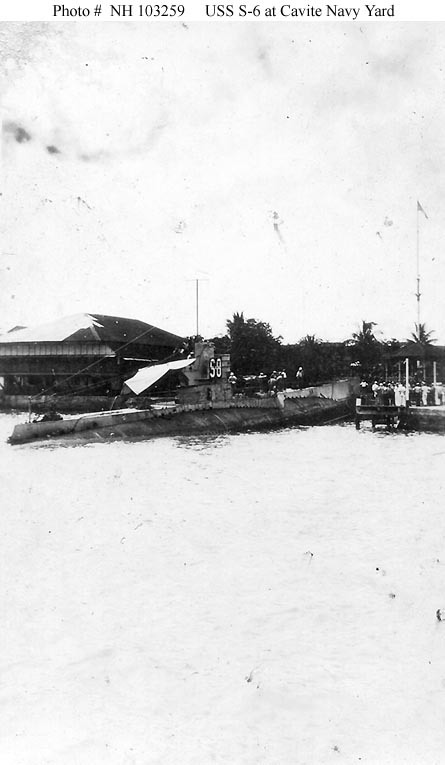 42k S-8 (SS-113) at the Cavite Navy Yard, Philippine Islands, circa 1921-1924. U.S. Naval Historical Center Photograph # NH 103259. Collection of Chief Engineman Virgil Breland, USN. Donated by Mrs. E.H. Breland, 1979. 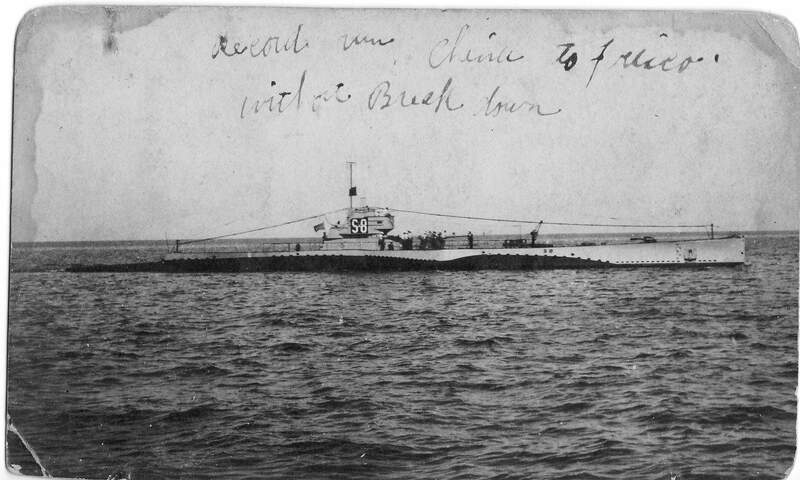 234k The S-8 (SS-113) in 1924. Inscribed on the photo is a comment about their record run from China to Frisco without a breakdown. The contributors father was James Everett Gholson who served on as Seaman 1st Class & Ships Cook 3rd Class. Photo courtesy of James Edward Gholson. 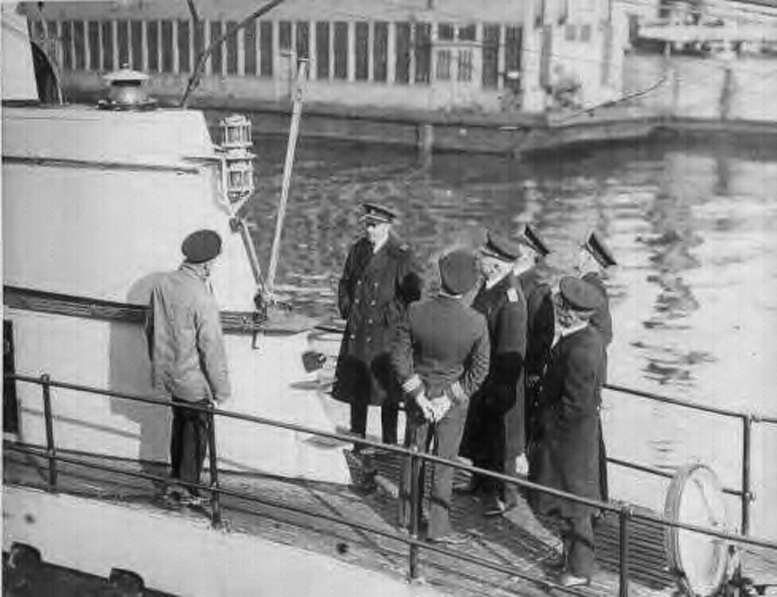 244k S-8 (SS-113) being examined by Navy officers for clues on how to salvage the S-4 (SS-119) that has sunk with all hands. 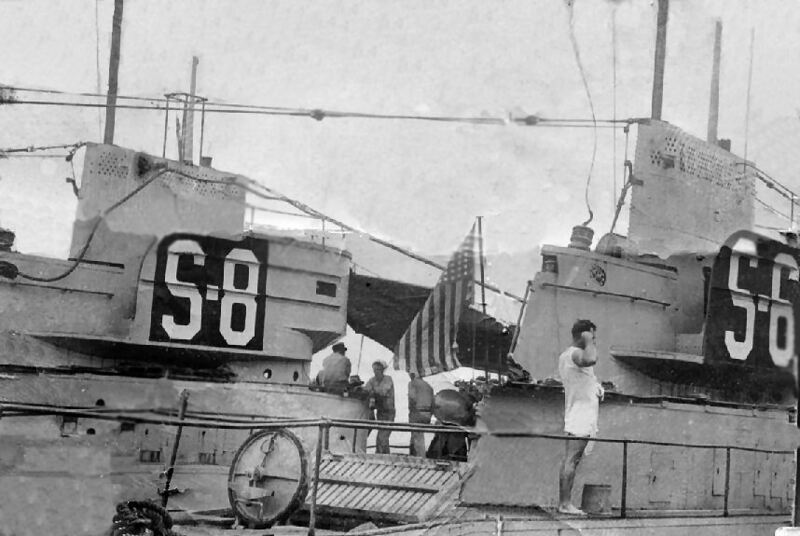 The S-8 was at one point the Flagship for Submarine Division Twelve. Text i.d. courtesy of Ric Hedman. 80k The S-6 (SS-111) & S-8 (SS-113) circa 1924 - 26. On 30 December 1924, S-6 and her division (SubDiv 12) arrived at Mare Island, Calif. They operated along the west coast until 15 February 1927; in the Panama Canal area during March and April; then returned to New London on 3 May to operate along the New England coast. Photo courtesy of James Edward Gholson. Text courtesy of DANFS. 223k Stern view of the S-7 (SS-112) with the S-6 (SS-111) & S-8 (SS-113) docked ahead somewhere on the Pacific coast during the mid 1920's. Photo courtesy of Charles J. Townsend via his son, Jim Townsend. 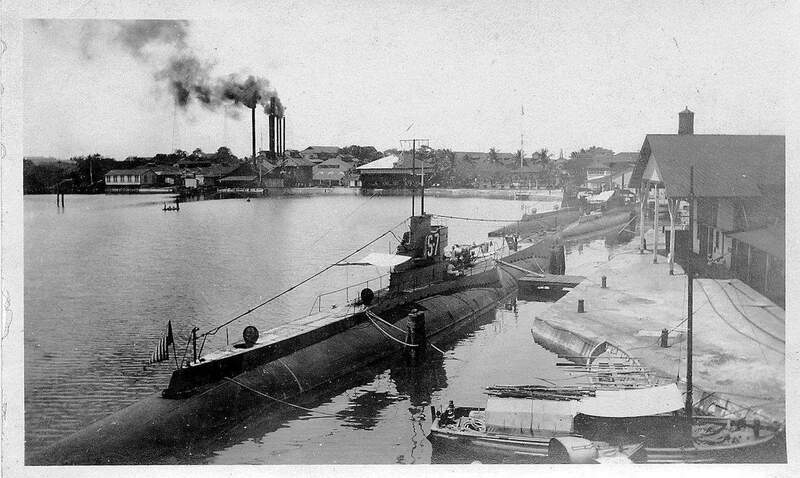 S-8 (SS-113). U.S. Naval Historical Center Photograph # NH 53436. 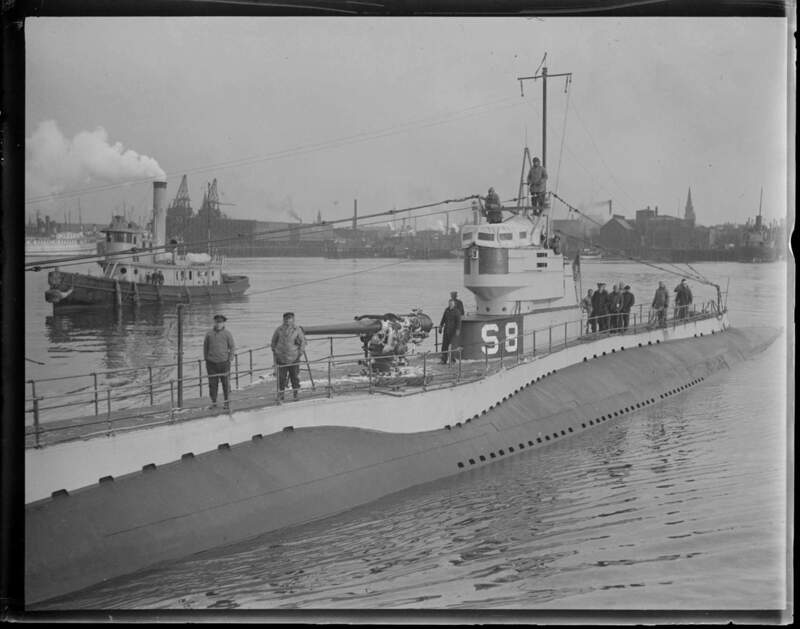 466k The S-8 (SS-113) possibly at New London, circa late 1920's. USN photo courtesy of ussubvetsofwwii.org. 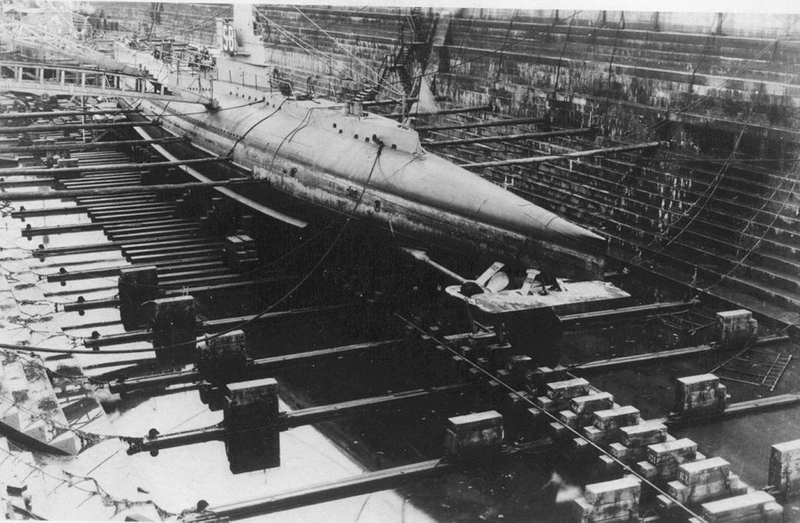 904k The S-8 (SS-113) in drydock, note stern plane arrangement. It seems to be one large plate with a single ram for moving it. USN photo courtesy of Milne Special Collections, University of New Hampshire Library, Durham, N.H. Photo and text contributed by Ric Hedman/rddesigns.com. 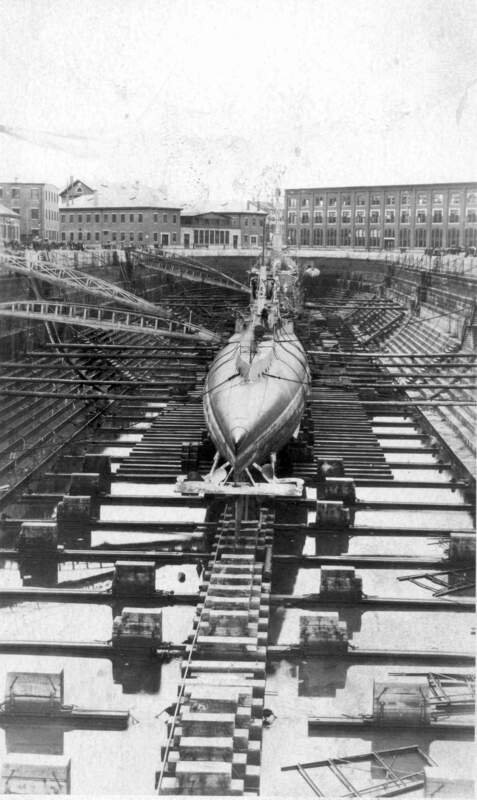 212k S-8 (SS-113) in dry dock. USN photo courtesy of Scott Koen & ussnewyork.com. 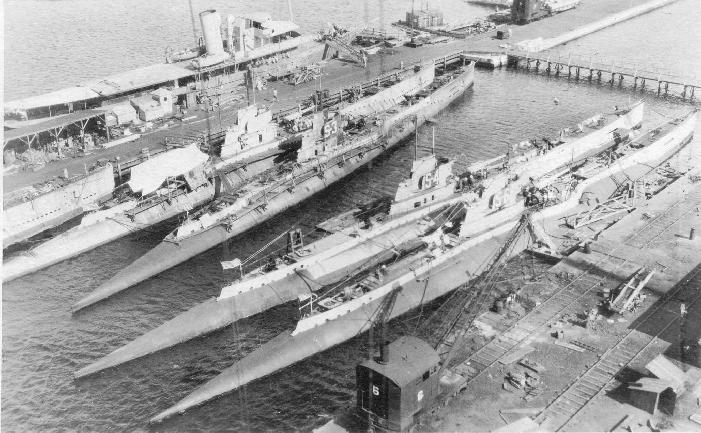 74k The S-8 (SS-113); S-3 (SS-107); S-4 (SS-109) & S-6 (SS-111) at Portsmouth, NH. The boat on far left can't be identified. USN photo courtesy of Milne Special Collections, University of New Hampshire Library, Durham, N.H. Photo and text contributed by by Ric Hedman/rddesigns.com. 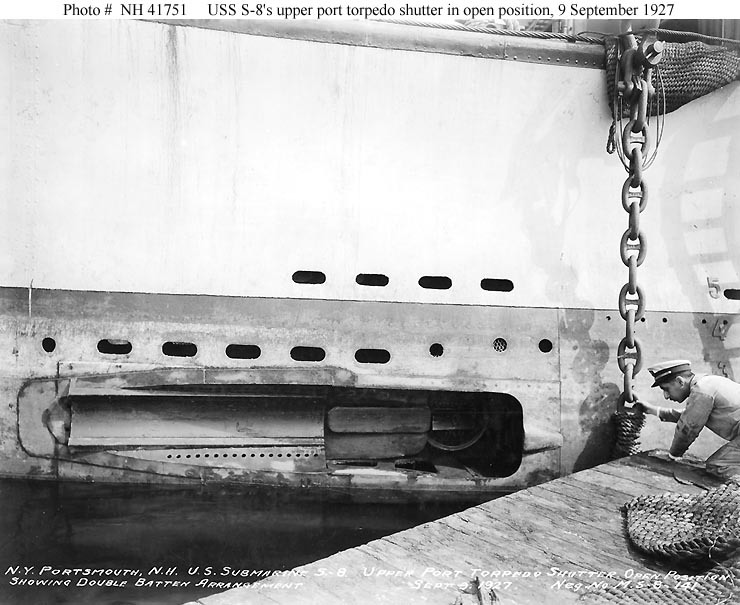 91k Port side upper torpedo tube shutter of the S-8 (SS-113) in the open position, showing double batten arrangement.Photographed at the Portsmouth Navy Yard, Kittery, Maine, 9 September 1927. 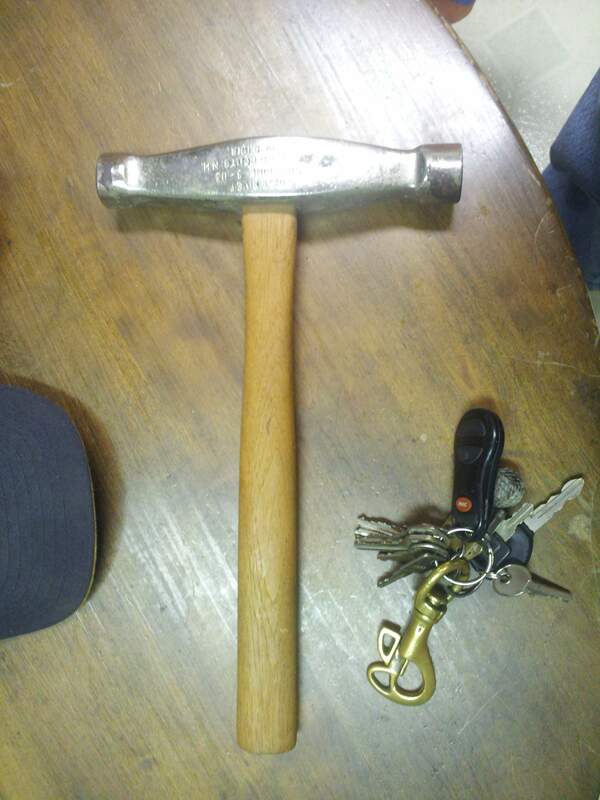 Note the chain at right. U.S. Naval Historical Center Photograph # NH 41751. 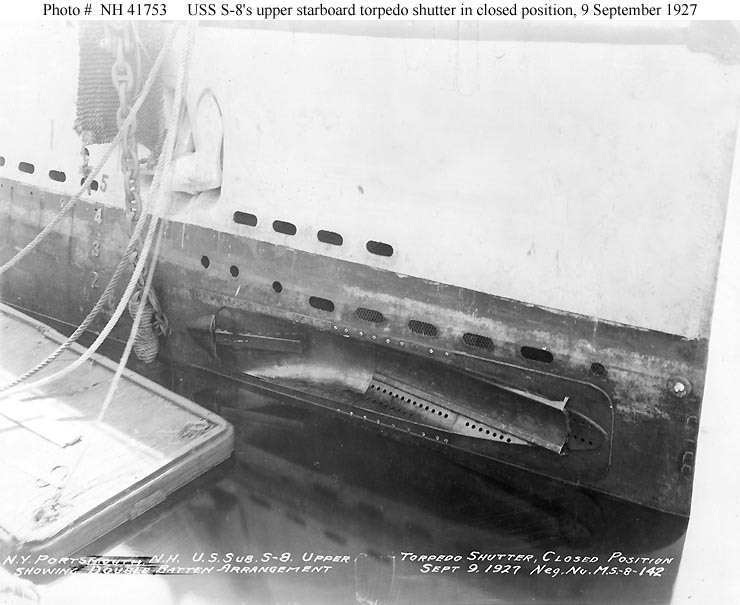 68k S-8's (SS-113) starboard side upper torpedo tube shutter in the closed position, showing double batten arrangement. Photographed at the Portsmouth Navy Yard, Kittery, Maine, 9 September 1927. U.S. Naval Historical Center Photograph # NH 41753. 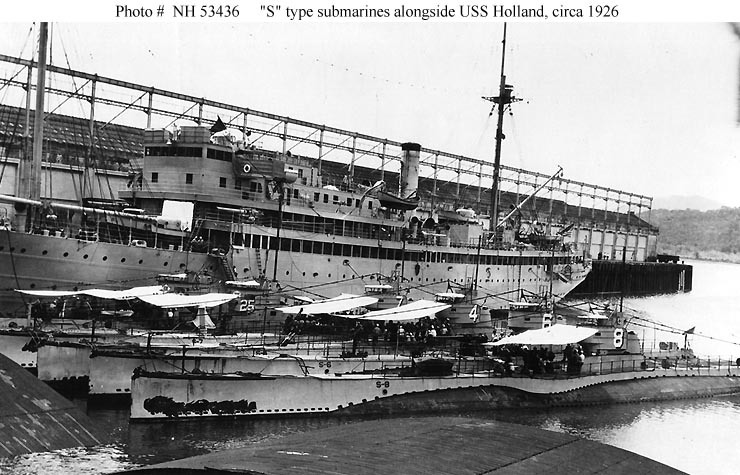 223k Sub S-8 (SS-113) at the Navy Yard after standing by S-4 (SS-109) off Provincetown when she was rammed and sent to the bottom by Paulding (CG-17) on 17 December 1927. Photo courtesy of the Boston Public Library, Leslie Jones Collection via Sean Hert & flickr.com. 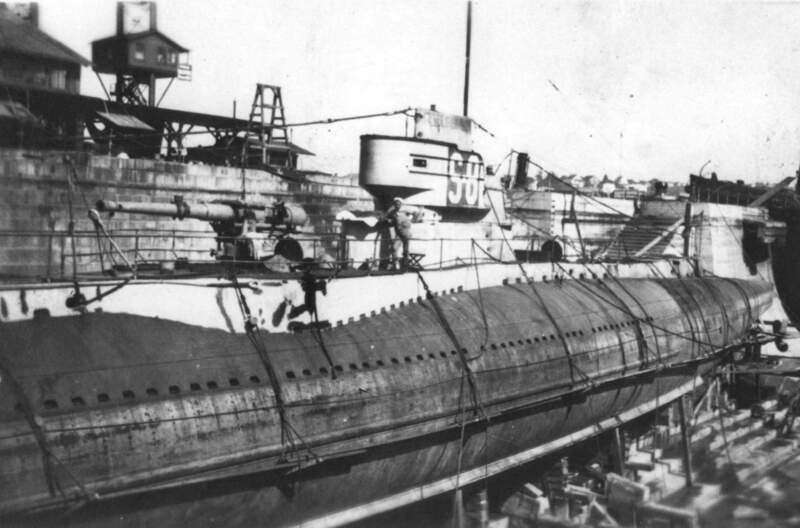 Divers fixed air hose to the valves on the S-4 (SS-109) and air was pumped from the S-8 (SS-113), a sister ship of the sunken boat until the air line broke. Nearby is the Falcon (AM-28), from which the divers worked. Image and text provided by Library of Congress, Washington, DC. Photo from Evening Star. [volume] (Washington, D.C.) 1854-1972, 19 December 1927, Image 2, via chroniclingamerica.loc.gov. NR While hope still survived for the rescue of the entrapped men in the sunken submarine S-4 (SS-109), A Navy diver descending from the minesweeper Falcon (AM-28) to the ill-fated submersible. Aboard the submarine S-8 (SS-113), sister ship of the ill fated S-4, which played an important part in the attempted rescue, fishermen are sending cigarettes to the crew by a line during the gale which halted rescue work. Heroic service was rendered by navy Divers in the attempted S-4 rescue. This shows Diver L.S. Michaels being carried unconscious from the rescue ship Falcon after nearly losing his life when his air supply was shut off. The giant derrick ship Century riding the gale above the grave of the S-4..... Image and text provided by Library of Congress, Washington, DC. Photo from Evening Star. [volume] (Washington, D.C.) 1854-1972, 01 January 1928, Image 60, via chroniclingamerica.loc.gov. 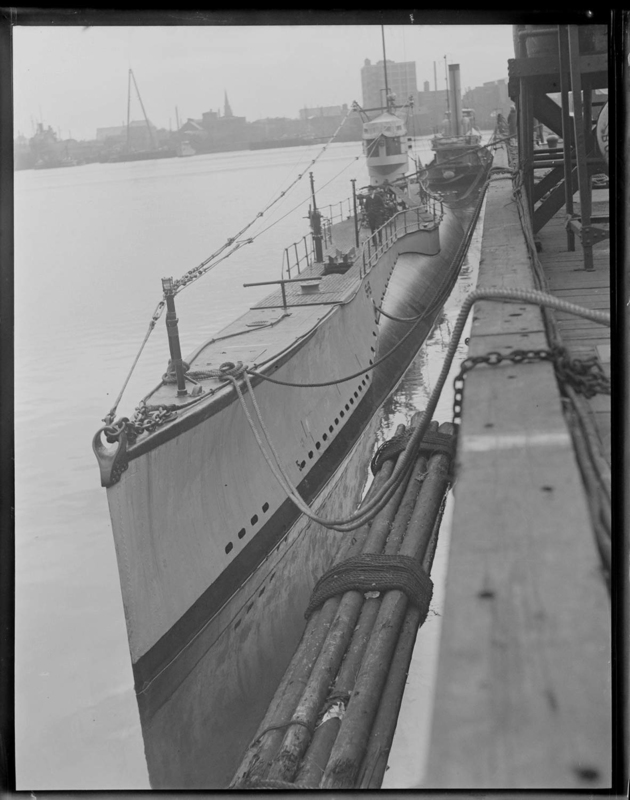 771k Sub S-8 (SS-113) in Charlestown Navy Yard, 15 January 1928. Photo courtesy of the Boston Public Library, Leslie Jones Collection via Sean Hert & flickr.com. 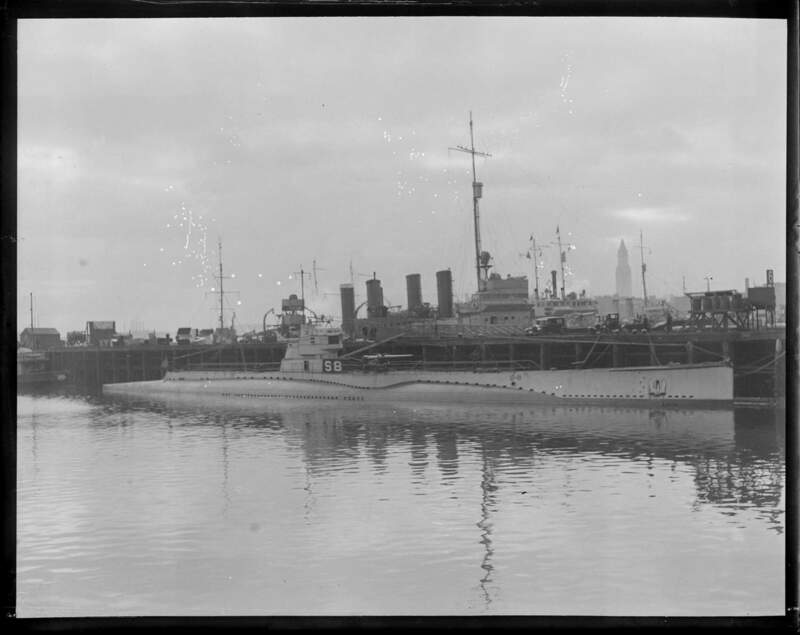 968k Sub S-8 (SS-113) coming into Charlestown Navy Yard, 1 March 1928. Photo courtesy of the Boston Public Library, Leslie Jones Collection via Sean Hert & flickr.com. 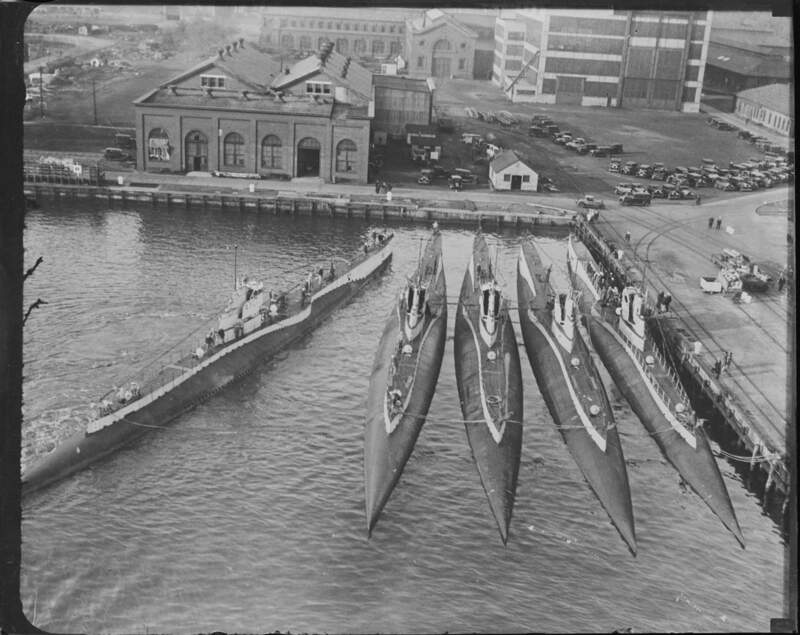 425k S-3 (SS-107), S-6 (SS-111), S-7 (SS-112), S-8 (SS-113), S-9 (SS-114) going out of commission at Philadelphia Navy Yard, 23 October 1930. Photo courtesy of the Boston Public Library, Leslie Jones Collection via Sean Hert & flickr.com. 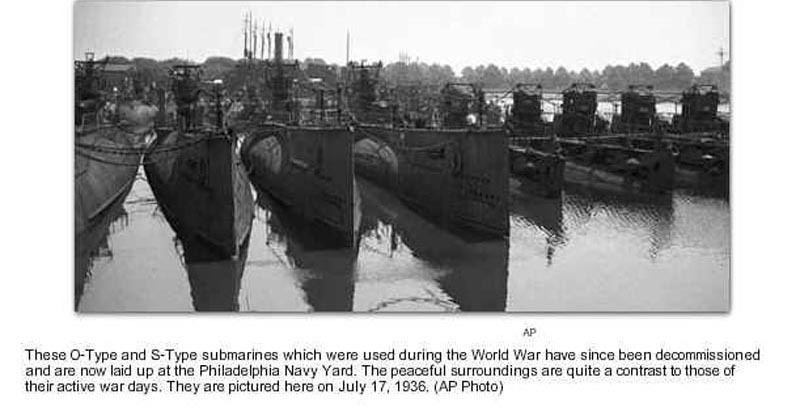 "These decommissioned U.S. submarines, built between 1917 and 1921, have been towed from the Philadelphia Navy Yard up the Deleware River to be junked. They will add some 4,430 tons to the nation's depleted scrap pile." It is possible that these subs are the S-3 (SS-107), S-6 (SS-111), S-7 (SS-112), S-8 (SS-113), S-9 (SS-114). They were all struck from the Navy list on 25 January 1937 and subsequently scrapped, date unknown. 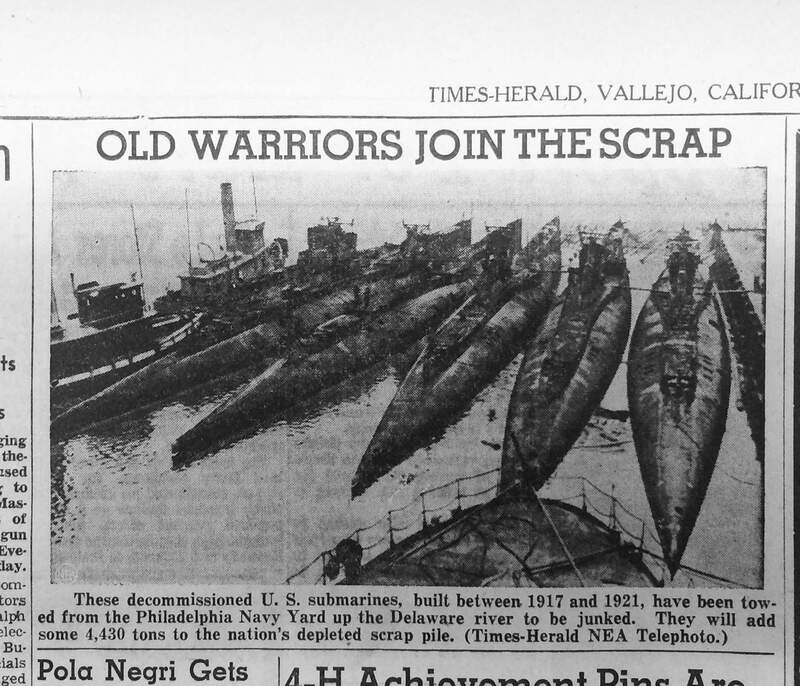 Photo from the Vallejo Times Herald, Vallejo, California, 25 October 1942 courtesy of Darryl L. Baker.